After rebooting FreeNAS, the Console should be functional. Tested with FreeNAS 11.0-U4. The problem can be permanently fixed by editing the configuration from the Grub Menu. Note: My system failed to display the underline character. It shows a blank, instead of the underscore. However, it still works. You can also customize the FreeNAS Installer ISO to make manual changes in the grub config obsolete. This requires a Linux machine with the ISO management tool Xorriso. Create variables containing the paths from both, the old and the new, grub config. Create the custom ISO with changed grub.cfg. Make sure to keep original Volume ID and timestamp. xorriso -as mkisofs -o /tmp/FreeNAS-11.0-U4-Gen10.iso -r -V 'FreeNAS' --grub2-mbr /tmp/freenas.mbr --protective-msdos-label -efi-boot-part --efi-boot-image -c '/boot.catalog' -b '/boot/grub/i386-pc/eltorito.img' -no-emul-boot -boot-load-size 4 -boot-info-table --grub2-boot-info -eltorito-alt-boot -e '/efi.img' -no-emul-boot --modification-date=2017092507154900 /mnt/freenas/ -graft-points "$oldg"="$newg"
Write the Image using dd or Image Writer to a flash drive. Writing to 'stdio:/tmp/FreeNAS-11.0-U4-Gen10.iso' completed successfully. Use another System to Install FreeNAS and transfer the flash drive to the Gen10 Microserver. The problem only affects Display and VGA output. The system will boot headless. You can't see console output, but the system will be available on the network. Mount the FreeNAS Installer ISO file and select "Connect at power on"
Connect a USB Flash Drive to the Virtual Machine. Make sure that it is connected by verifying the Disk Icon in the bottom right corner. You can safely ignore the memory warning. Wait until the Installer has finished. You do now have FreeNAS installed to a flash drive. Power off the virtual machine, plug the drive into your Gen10 Microserver and boot from it. 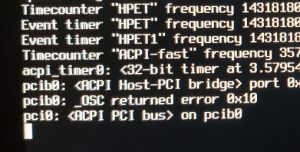 The system still apears to be stuck at pci0: <ACPI PCI bus> on pcib0 (We will fix that later! ), but it will silently boot in the background. If you have a DHCP server, check the log and wait until FreeNAS gets an IP Address. You should be able to acces the web interface and do the configuration. Thank you to Tobias Riewoldt for providing the Grub and Custom ISO fix. Thank you to Bob Bishop for pointing me in the right direction. Just wanted to throw out a random THANK YOU for this. I can't belive how obscure this error was. I was helping my dad with the installation and we got stuck booting the installer USB drive. What a well done article! Your solution worked flawlessly. Thank you very much for first of all debugging the problem, and then providing a clear guide for numpties like myself to follow! May your networks never be clogged and the processors run cool for you! Thanks! It worked and saved my day! In the section "Installation Option 1 - Edit Grub Config during Startup" the second image that shows a close in crop of "set..." is missing the 'kFreeBSD.' part. Wow! Again a super thank you for such a great fix and well documented how to! In order to boot into FreeNAS that is now installed on the system I have to enter the set kFreeBSD.hw.pci.realloc_bars=1 every time. Is there a way to save that entry permanently? It should be permanent if you add it to the Web Interface as explained in the article. FreeBSD Bug #221350 is still unresolved, and this method is no longer working as of FreeNAS 11.2-RC2. The boot loader has changed from GRUB to the native FreeBSD boot loader. New work around may be to extract the iso and use a hex editor to change the value of realloc_bars to zero in boot/kernel/kernel and/or add the options to boot/loader.conf. Haven't had success with either. Just use default ISO. 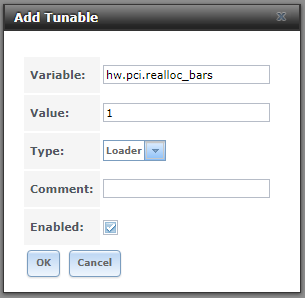 Press "3" at boot, then "Esc", then type "set hw.pci.realloc_bars=1" followed by "boot". Then you can apply the work-around in the GUI still in 11.2 from web panel after a successful boot.